Completely customizable, this allows you to give the gift of a visual keepsake, containing a heartfelt message! 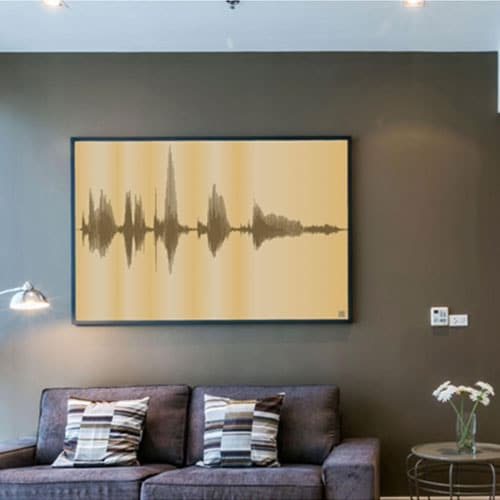 This Voice Art Canvas truly is the most personal and heartfelt gift you could give to your loved ones. Record a message saying, “I love you,” and have it printed on a canvas to hang in your home! For more of a humorous approach, record yourself saying an inside joke between you and your friends or family, and gift it to them for Christmas. As a gift for dog lovers, this canvas can even have the sound of your family’s dog bark printed. With a little creativity and a good idea, this can be the best Christmas gift your loved ones have ever received. Not only is the Voice Art canvas great for personal gifts, but it also is a fun, yet professional, idea for corporate and executive gifts. Record yourself saying the company’s motto or mission statement, and give it to your employers to make an excellent impression, while adding a bit of unique decoration to the office. This canvas will look great mounted over a reception desk, on an office wall, or even in the hallway. If you purchase for personal use or family gifts, it would be the perfect addition to a baby’s room, above a mantel, or in any room of the house! This gift can be completely personalized, and it will be a fantastic and heartfelt present to whomever you present it!